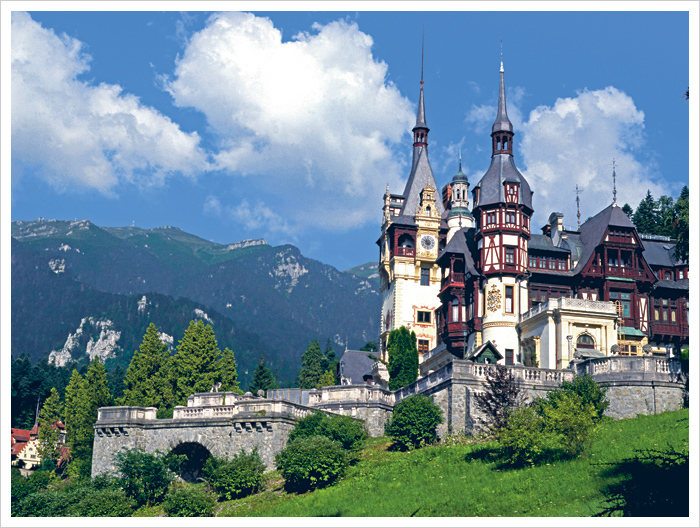 ﻿ Peles Castle - Castles and Fortresses in Romania. The furniture in the Music Room is carved of teak, a gift to King Carol I from the Maharajah of Kapurtala in India, while handmade silk embroideries adorn the ceiling and walls of the Turkish Salon. The ceiling paintings and decorative frescoes in the Theater Hall were designed by the renowned Austrian artists Gustav Klimt and Frantz Matsch. King Ferdinand, who succeeded Carol I, commissioned the smaller, art nouveau-style Pelisor Castle nearby. Pelisor's 70 rooms feature a unique collection of turn-of-the century Viennese furniture and Tiffany and Lalique glassware. Medieval towns of Sighisoara (88 miles) and Sibiu (105 miles).